During This Sedona Holiday Season – It’s All About Gratitude…. Ahh Sedona! Coming from Southern California where the leaves turn brown during November and either blow off the trees, we never really experienced the change of seasons. Warm Santa Ana winds would let you know November was upon us. Sedona is in a different climate zone, offering a distinct change of seasons. My family has been enjoying this Thanksgiving celebration for over a decade now in this beautiful area we call home. I am grateful to have them here. It gives me a chance to let them know how much I appreciate them every day. But it does not stop there. My family is deeply involved in the real estate business. My husband Rick, colaborates with me on marketing decisions, provides our customers with beautiful pictures of their listings and has created my websites and customer listing websites, as well as our internet presence over the years. He volunteered for 2 years as a site council community representative at our Red Rock High School. My son, Ricky, helps me and my customers with small maintenance jobs to prepare properties for listing. My daughter-in-law, Samantha, found herself a job as a receptionist… at my office! Also, Ricky & Samantha volunteer at our local Humane Society. I have volunteered at our Senior Center serving meals and occassionally filling in as a driver for Meals-On-Wheels. As for my business, I am grateful for every buyer and seller who decides they want to work with me. What that customer does not know is that they become an extension of my family. I will do for them, what others may not. It is most noticeable with clients who have homes or live in other areas of the country. A case in point of a complimentary service for a buyer might be to take pictures of their home while it is being built. Going out and previewing homes or home sites and taking additional pictures of areas that may not be presented on the MLS. Straight-forward talk on good and not-so-good points of homes a buyer may be looking at. For those who list with me, besides offering at no additional charge, premium and luxury services that others will charge for, I watch over absentee owners homes. I make sure the home is always presentable inside and out. If that means sweeping a front entrance or changing flowers or a light bulb, I don’t bother the seller with those issues. I check each listing regularly. When there is a maintenance issue, I will inform the seller and help with scheduling and supervising services. We also change out pictures as the seasons change or staging and landscaping change. Everything we do is part of the service I offer. I show my personal gratitude to my family and my customers in a very personalized way once the property closes. While working with my customers, I listen to what is important to them and I tailor my gratitude to them. I have picked up staging and moving costs or took care of minor home repair costs etc.. When out-of town buyers come in from thier travel, they have been surprised with a bottle of champagne and gift basket or beautiful house warming gift. Just a little thank you. My family and customers mean the world to me and I want them to know that I appreicate their confidence and trust in me. I think I have stated my goals very well on my website at Sheri’s Corner. Something that I started mid year is a monthly newsletter and also a fun newsletter that keeps me in front of my customers. Because of the appreciation I show towards my clients, referrals are an important part of my business. I have two business goals tied to Word Class Service with my customers. Close one deal a month (12/year) while making the 100% Club at Re/Max every year. My personal goals include spending more quality time with my family through special dinners and celebrations along with mini get-aways. In the Sedona Formula, gratitude is tied to family, friends, work associates and customers alike. It is a life commitment that takes priority every day of the year but we want to emphasize this positive approach especially during the holiday season. To have an open house or not to have an open house over the Thanksgiving weekend: that is the question! Many sellers assume that the Thanksgiving holiday weekends and the week between Christmas and New Years Day are less than favorable times to have an open house. Some real estate agents disagree. Often, because both sellers and their agents assume the holidays are off limits, if you have an open house over the holidays, you’ll have less competition. Typically, the number of open houses during the Thanksgiving holiday is less than half what a normal weekend might have. That means your home may get more exposure than it would with more competition for the same day. Since many people have that weekend off, it may be the best opportunity for them to go out and look. When the buyer and seller both are serious, a holiday open house can be effective. When the buyers are motivated, they are more than happy to shirk Black Friday shopping in hopes of finding the right house. A recent survey of real estate agents revealed that two-thirds of them believe a Black Friday home seller is more serious and over sixty-one percent believe Black Friday buyers are more serious. If a buyer needs to complete the deal prior to the end of the year for financial reasons, the Thanksgiving weekend is the last opportunity for a big push toward that goal. Homebuyers waiting for their year-end bonuses to add to their down payment often take advantage of the holidays to house hunt. Young couples seeking to relocate nearer to family most often “come home” for the holidays. Since they are in the area anyway, they take the time to see what is available on the market. Exposing your home to buyers during this time may give them the impetus they need to make the move they already want to make. Holding an open house in winter has both advantages and disadvantages, so here are some best practices to make sure your open house is a success. DON’T over decorate. While buyers may adore your holiday décor, they also want to be able to see the home’s features. DON’T forget to remove holiday feast leftovers. This includes airing out the smells of cooking from the day before. When a home is closed up in the winter, those stale odors linger even though those living in the home no longer smell them. DON’T hang around. Find a special place to take your family while your agent handles your open house. Buyers, even serious buyers, may be uncomfortable asking serious questions with the homeowner present. DO put your pet in a safe place. Strangers in the home can make your pet anxious and potential buyers may find animals frightening or off-putting. DO turn on all the lights. In the winter, the sun sets early, and even a daytime open house may find a cloudy day. Potential buyers prefer light bright rooms. That means windows and blinds should be open as well. DO keep the heat to a comfortable temperature. While your family may prefer it cooler, or you choose to conserve energy by wearing sweaters and extra layers, do not assume your potential buyer will appreciate those efforts. If you are considering a holiday open house, contact us immediately so that we have advance marketing in place for the best possible turnout. “Stuff Happens” How Does Living in 86 SF Grab You? I saw this video and was astonished at what this person did with the amount of living space they had to work with. This is “out-of-the-box” thinking at it’s very best. Think about this…. I measured my dining room table with two leaves. It is 8 feet long by 4 feet wide. 86 SF is 2.7 of my tables side by side! Watch the video below to see how it was accomplished. Ask yourself, could you live like this? Tiny apartment in Paris (8sqm only) from Kitoko Studio on Vimeo. This video stirred many emotions as I watched it. I remember all too well what it is like to empty a huge home and ask yourself …What am I going to do with all this “stuff”? What do I keep? What do I get rid of? (etc.-etc.-etc.)! It was and still is emotionally draining. I sometimes ask myself, How in the heck did I accumulate so much “stuff”? There are a lot of questions that a video like this could stir up, either from a personal perspective or from a real estate perspective. From your personal point of view, have you ever felt guilty because you have so much “stuff”? Do you feel frustrated that you can’t tackle getting rid of the “stuff”? Because housing is so expensive for those just starting out in life, is this the alternative that will continue to trend (especially in big cities or metropolitan areas)? How will this affect the real estate market going forward? Minimalist – This is a whole different lifestyle. I would love to get there but “stuff happens”! Here are a couple of links you may be interested in from a minimalistic POV. 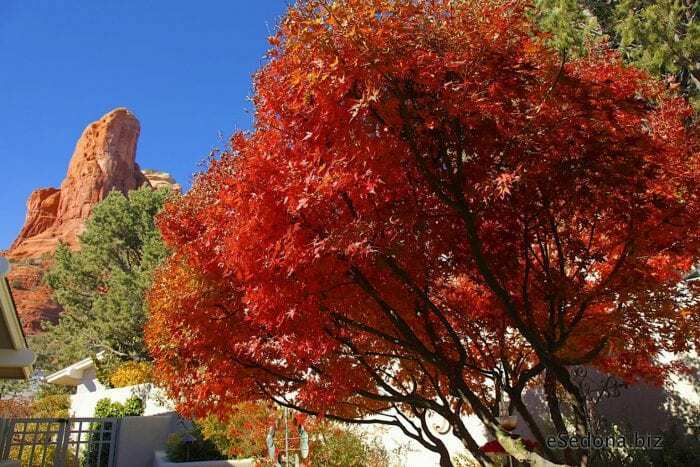 Typically homes in Sedona don’t experience the change of colors and falling leaves until mid November. Depending on the temperature drop, it could be slightly earlier or later. Go to Rick’s World Sedona for more detailed weather information. Click on the “Sedona Weather” tab. Also, click on button “See Additional Fall Pics Here” on main page below cornucopia. As evidenced by fall pictures on Rick’s World leaves turn beautiful shades of red, vermillion, orange and yellow. We enjoy their beauty. We take photographs. We collect them. Our children play in them. For a homeowner, however, leaves pose the possibility of damage to their landscaping, their home and their relationships. If you’re new to homeownership, you may not know that while allowing leaves to lay a thick carpet over your lawn is beautiful, a solid mat of large wet leaves, such as those from oak, maple or sycamore trees, can damage your lawn. They promote mold growth, cause moisture to run off rather than seep into the ground, and hide the grass from the winter sun. Raking. This historic method of dealing with leaves is still the preferred method for some lawns. 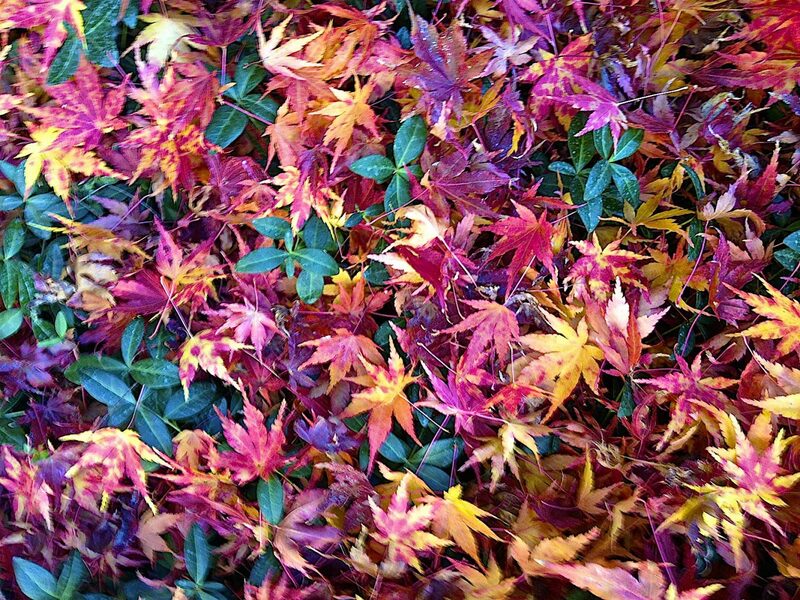 If you have specialty turf, lightly raking and removing leaves protects your lawn from damage. Bag leaves or ad them to your compost pile. Remember that paper bags will decompose much more quickly than plastic ones. If your city offers leave removal, be sure to utilize the appropriate process required. Mulching. Many mowers have mulch settings that chop the leaves into smaller bits that you can leave on the lawn to decompose naturally, and add nutrients to the soil. Blowing. Many gardening professionals prefer blowing leaves out of flowerbeds and lawns with power blowers into large piles to then “vacuum” them up with large machinery and haul them away. Typically, you would hire a professional to do this since purchasing the equipment for yourself might be cost prohibitive. 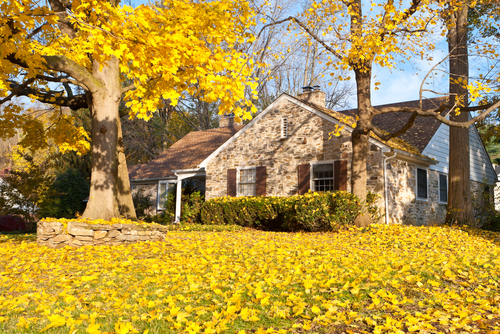 Blowing and falling leaves create problems for your gutters. Once most of the leaves have fallen, you should have your gutters inspected for clogs. A clogged gutter is more than just an inconvenience. It can cause water and ice to back up under your roof creating leaks and other damage. When rainwater overflows a clogged gutter or plugged downspout, your fascia and soffits are endangered, too. Water backing up a downspout may dislodge or warp gutters, pulling them away from your house. When water spills down the sides of your home, it damages windows, walls and even your foundation. Consider a professional gutter-cleaning service, especially if your home has more than one story. You might investigate gutter guards if your property is particularly prone to leaf buildup. Your local gutter professional can help you determine what works best in your situation. Most municipalities consider leaves to be a natural product, so while a homeowner might be responsible for damage to a neighbor’s home from a falling branch, that is not the case with falling leaves. So, when the leaves from your yard blow into your neighbor’s yard, they may not have a legal claim, but it will strain your neighborly relationships. Make sure to talk to your new neighbors about the leaf situation. If your neighbor finds them a nuisance, you might offer to rake their yard as well. The best neighbors come up with a solution together. A common question for prospective home sellers is “How can I increase my home’s value or get a higher selling price?” In our earlier articles on this subject, we discuss low budget and economical fixes and upgrades that can increase the perceived value of your home and help your home sell quickly. In this article, we discuss those higher cost items that only give you a high return on your investment if you have high equity in your home or will lose more money if it doesn’t sell quickly. Many buyers look for a home they can move into immediately. While the specifics depend on the age and condition of your home, here are the priority renovations that increase your home’s appeal and return on investment potential. No matter what the other advantages of your home, if the buyers do not like the kitchen, they are less likely to make an offer. So, if you’re planning major upgrades, head to the kitchen first. Paint, refinish or replace the cabinets. If your cabinets are dated, damaged or dark, consider replacing them or painting them with a lighter, newer version that still fits into the home’s style. If you’ve never painted cabinets, consider hiring a professional since they are more difficult than painting walls, and poorly painted cabinets actually decrease the appeal of your kitchen. Replace countertops. If granite is all the rage in your neighborhood and comparable homes have granite countertops, consider this upgrade. Granite requires professional installation to measure, cut and polish the rock correctly. A less expensive version, granite tile, is easier to install, but has less overall value. Add new appliances. New, matching appliances including ovens and stovetops or ranges, dishwashers, refrigerators, microwaves and refrigerators instantly update a kitchen. Upgrade lighting, fans and fixtures to match the style of your new cabinets and countertops. Kitchen floors with carpeting, vinyl or worn and broken tile should be replaced with new ceramic or other tile, wood, or another new product. Make sure you only replace kitchen floors with flooring that can handle the traffic, spills and constant cleaning that a kitchen requires. No new homeowners want to feel as if they are using someone else’s bathroom. Replace the vanity, sink and toilet. Use low-flow toilets, water-saving faucets and other green products. Replace the floor and shower surround with a neutral tile. If your bathroom has a built-in tub/shower replace it or have it professionally refinished to look fresh and new. Carpets harbor dirt, dust mites and stains. Replacing the carpet in major living areas with hardwood increases the visual appeal of your home. As an instant upgrade, hardwood gives your home that updated look. It also attracts buyers that cannot live in carpeted homes for health reasons. These major home appliances often are out-of-sight and out-of-mind, but a new buyer wants to know they’ll work when they need them. To increase the value of your home, improve the “R” rating and make your home more economical, consider replacing the roof, insulation, siding and windows. If your home has hail or other storm damage, check with your homeowner’s insurance to see if they will cover the replacement. Using better quality, energy-saving products gives your home more curb appeal and buyers know they won’t have to worry about leaks and drafts when weather hits. Consider doing your homework and getting estimates for the replacement costs. 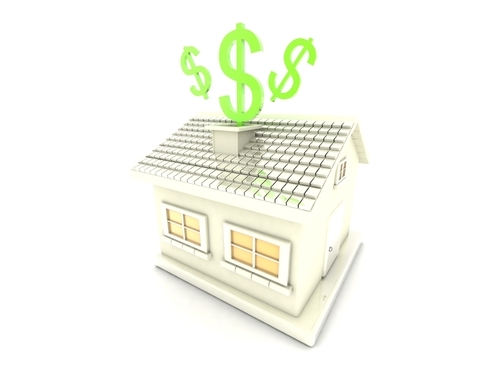 You can offer an “allowance” that can be taken at closing to entice the buyer to consider your home for purchase. However, this is not a panacea. As discussed earlier, most potential buyers want a move in ready home. What this allows you to do is create a condition for those who may be willing to take on a project to consider your home. You have done the legwork for them, with bids, potential contractors or professional services ready to do the work and most importantly, tied a cost to the project. The difference between doing the project versus providing an allowance for the project is two-fold. 1) A completed project adds value to your home. It may also add more value than the cost of the actual project. 2) Besides the potential for a better Return On Investment R.O.I., you will create a faster sales cycle. We can assess the potential R.O.I. for these and similar upgrades to your home. Call Sheri Sperry at 928-274-7355 for an evaluation of your home’s fair market value or click on the button. This adorable West Sedona Cottage for sale inspired from the Frank Lloyd Wright style is Sedona from another time. Attention to detail includes the beautiful vaulted wood ceilings which were carried throughout the house and to the side patio. Bathrooms updated in 2010, newer appliances in 2013, new evaporative cooler in 2014. Located in the heart of West Sedona with easy access to shopping & theatres. There is a partially finished walk-out basement (which is heated & cooled) for a workshop, potting shed, art studio + organic gardens, mature vegetation, privacy & shade. VIEWS FROM THE DECK! This eclectic neighborhood lends a special feel to this house that exudes charm & touches that are rare today. – See more at 365 View Drive Sedona, AZ 86336. 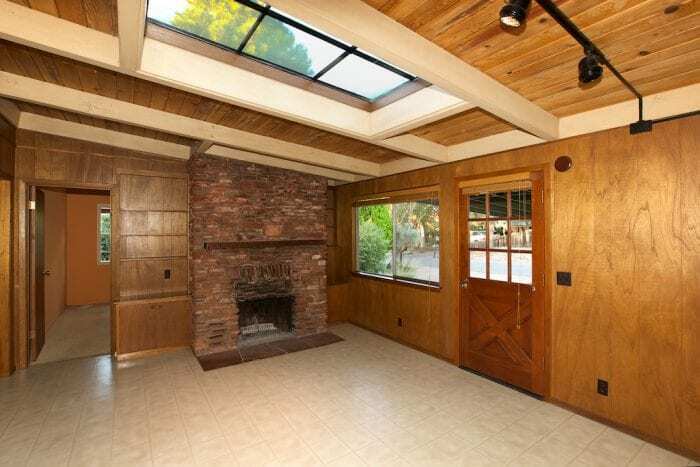 This West Sedona cottage has character that is rarely seen in current homes for sale. 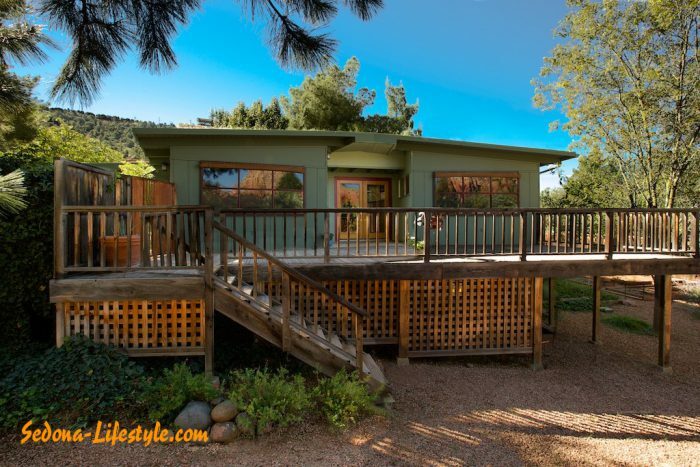 This West Sedona AZ Cottage for sale by Sheri Sperry, Sedona Real Estate Expert, has received a lot of attention and was in contract in one day! As you are planning a Fall open house in Sedona, and your Sedona home is newly on the market, you have to take in consideration the shorter autumn and winter days, freezing temps, and deeper shadows. Consider these ideas for making your open house bright, warm and welcoming. In the spring and summer, it’s easy to make the exterior of your home appealing by keeping the lawn green and trim, adding showy blooms to your flower beds and trimming the hedge. If your lawn is the type that goes dormant in the winter, you know it won’t look its best, but you can make sure it receives a final trim and has clean edges. 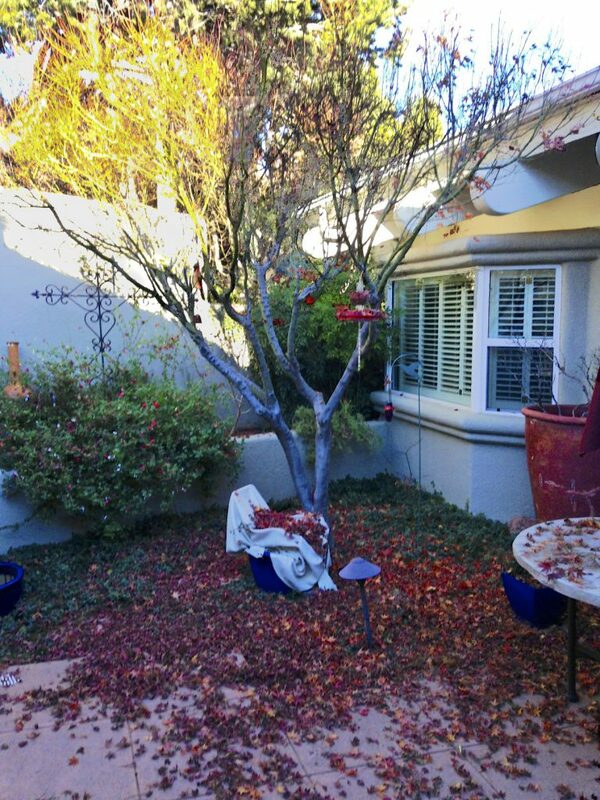 Keep the leaves raked and bagged, and add fresh mulch to your flowerbeds and the bases of your trees. 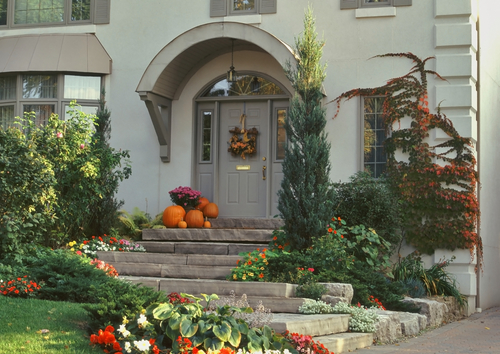 To bring some color to your exterior, add some potted chrysanthemums—they come in a multitude of beautiful colors that can display your architecturally interesting porch, fill in blank spaces in your planters or hide pruned bushes. You can even add a little lawn decoration with hay bales, pumpkins, squash or gourds, mums and marigolds, and brightly colored foliage such as crotons. Avoid gaudy or garish decorations, however, as they can be a distraction. Place a welcome mat outside both the front and back doors especially designed to remove dirt from shoes and boots like this one from LLBean. Designate a place for wet outerwear. When potential buyers arrive during a downpour, it is important to let them know you have planned for them. Have empty hooks, or an empty coat closet available for their wet coats, scarves and hats. Place an umbrella stand just inside the door. If you have room, you can use a combination coat rack and umbrella stand. This decorative rack from the Home Depot has room for both in a stylish but heavy-duty construction. Once winter weather sets in, make sure your sidewalks are swept or shoveled, and that you have removed any ice from pathways and steps. When it is cooler outside, buyers want to know that the furnace or radiators function. Avoid overheating your home, which can make it uncomfortable for buyers that keep their coats on. Aim for about 70°F. Be sure that windows are caulked and that there are no obvious drafts. If you have a gas fireplace, consider turning it on to add a cheery glow, but if your fireplace is wood-burning, consider using candles inside the fireplace instead since some buyers may be allergic to wood-smoke. Finally, make sure your windows are clean and sparkling. Open drapes so buyers can see the view, and turn on lights in every room to chase away any dark shadows. 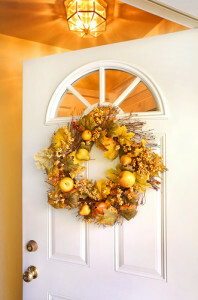 You can add seasonal interest with a pretty wreath on the door and pumpkin or spice scents throughout the home. When preparing your home for a fall open house in Sedona, we can help you determine the best way to display your home’s special features. As a Sedona Realtor®, I participate in most of the home inspections for either my buyer or seller. One thing you do not want to do is defer maintenance on your home. As you will see below, it can lead to bigger problems and costly repairs. If you’re new to home ownership, you may not be familiar with all of the responsibilities that are now yours. All of those things you used to call the super or management office for now fall in your lap. Here are some items to keep in mind, especially if you got a “great deal” on your home because it needed a little TLC. A great place to start is to thoroughly review your home inspection report. Use it as a checklist to do your own inspections. In the Sedona Verde Valley area, I can help you find a reputable home inspector. 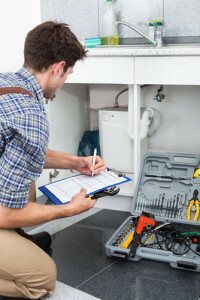 Plumbing maintenance can by far cause some of the most costly problems if you ignore those little, niggling drips, clogs or strange sounds in the pipes. Leaks and drips under the sink are out of sight, so they often are out of mind. However, a buildup of moisture in a sink cabinet can set the stage for costly mold problems. If the leak is on an upper level and the moisture seeps into the walls and subfloor, it endangers the structural integrity of the ceiling below. Latex paint has the particular ability to “stretch” and hold moisture. When this happens, you may not notice the damage to the ceiling below until the paint forms a moisture-filled bubble. By this point, drywall, insulation and subfloor will need extensive and expensive repairs. We have many homes that are on septic systems in the Sedona Verde Valley. Fortunately, before a home is sold, the system must be pumped and certified. This is one area that seems to be forgotten over the years by some homeowners. A typical system may last between 15 and 20 years. But regular maintenance will keep your system in top condition. Better to get the leak looked at right away by a certified plumber. Missing shingles: During heavy downpours, strong windstorms or as snow and ice melts and slides off your room, tearing shingles away. While roofing tiles are designed to overlap, offering double protection, when one layer is missing, water can seep underneath and cause damage. Having a few shingles replaced is much less expensive than have to completely replace the deck (the layer of wood under your roof) of your home and completely re-roof it. Curling or lifting shingles: A curled shingle or a row of lifted or buckled shingles indicates that you may already have a leak, or the potential for one. Have these shingles replaced immediately and inspect the deck and sub-roof materials for damage. Decay and mold: When mold, moss or lichen grows on your roof it’s a sign that areas of the roof are holding water. Treat the growths with a killing agent immediately. Have damaged shingles repaired as soon as possible. Damaged flashing and drip edge: Flashing refers to the metal or vinyl pieces that surround chimneys, pipes, exhaust fans, while a drip edge is the metal piece along the outer edge of the roof. If any of the metal or vinyl pieces are bent, buckled, dented or have holes, your home may be exposed to water damage. A certified roofer can repair flashing and drip edges. Gutters are the metal or vinyl troughs that collect water runoff and direct it to downspouts away from the home. Gutters require extra maintenance. In the fall, leaves and debris collect in gutters potentially damning them and causing water to back up under the roofing tiles. Make sure to clean gutters each year before winter weather begins. In the winter, your gutters may fill with ice and snow forming an ice dam. The best way to avoid ice dams is to have sufficient insulation in your attic to avoid overheating your roof, and sufficient ventilation that accumulated heat can escape. Yes, it is too much heat coming from the inside of the house that causes a rapid snowmelt and pushes snow and ice into your gutters. Extra precautions: If you live in an area with lots of snow and ice, consider having ice and water barriers or shields added to the “valleys” of your roof. A valley is where two differently angled roofing lines meet and where water, ice and snow can pile up. If you have a breaker that continually trips or (in older homes) a fuse that blows, you may have an electrical problem. Of course, you may simply have too many items running on one breaker, but blown fuses and continually tripping breakers may indicate a fire hazard. Have your home inspected by a certified electrician. If you own an older home, with fuses, consider having them replaced with modern breakers. Replace outlets in bath areas with a GFI (ground fault interrupter) outlet that switches off when the outlet is overloaded or when the appliance comes in contact with water. We want your home ownership to be the best possible experience. We suggest getting an inspection before purchasing your home, and a yearly or bi-annual maintenance inspection to keep your home in top shape. When the time comes to sell this home and move to another one, you won’t have costly repairs needed before you can put it on the market. Once you are in your new Sedona home, light fixtures will be on your list to make your statement. It’s not just about wattage anymore. Light fixtures and light bulbs come in myriad types, sizes and colors. Do you want LED? Should you use “soft” bulbs? And what is the difference between watts and lumens? With the phase-out of the traditional incandescent bulb, the lighting choices you grew up with are not the same as what will be available in the future. When making choices for your new home, consider the light’s expected usage, the use of the room and the availability of replacement bulbs. Artificial light affects how color appears on your walls and ceilings. That is why paint colors that seemed so perfect at the paint store can look all wrong on your walls. Some popular bulbs for home use will change how color appears, and how a room “feels” when the lights are on. Incandescent bulbs. The bulbs we grew up with typically have a warm cast and brighten up colors in the warmer spectrums (reds, oranges, yellows) and dampen colors in the cool spectrum. However, as of this year (2014) most incandescent bulbs will be phased out for general use. Although there are exceptions for specialty bulbs, including some sizes of the very popular designer Edison bulb, when your bulb goes, you’ll need to replace it with some form of fluorescent or halogen bulb. Or, you’ll need a new light fixture altogether. Standard fluorescent bulbs. The long tubes used in schools, retail stores and offices emit cooler colors that enhance greens, blues and purples while subduing reds, oranges and yellows. These bulbs often “hum” in the background. Better for work areas (kitchen, garage), standard fluorescents offer an economical lighting source. CFLs. Compact fluorescents are the obvious choice to replace incandescent bulbs. With bayonets that fit most light fixtures, CFLs are available in a variety of sizes, shapes and wattages. They also have a Kelvin rating which determines the color spectrum of the bulb. The lower the Kelvin number, the warmer the colors. A “full spectrum bulb” is designed to mimic daylight. LEDs. Light-emitting diodes emit a warmer light. Often the “bulb” has a reflective cone that augments the light. LED light enhances most paint colors and gives natural lighting that works well for bathrooms and dressing areas. Halogen. Because of their whiter, brighter light and longevity theater stages use halogen lights for high performance applications. In the home, halogens reduce eyestrain as reading lights, offer safety and security to your outdoors and highlight your artwork. They burn hotter than other lights, though, so don’t belong in areas where the bulb can’t be shielded. Some older halogen fixtures—especially torchiere lamps—posed a fire hazard from the hot-burning bulb, so check to make sure your halogen fixtures have protective shields. When replacing light fixtures, consult a lighting designer to solve lighting challenges and create the most economical arrangement of your lighting profile. We can help you determine the best lighting upgrades for the sale of your home. Give us a call to set up an appointment for a home review today. 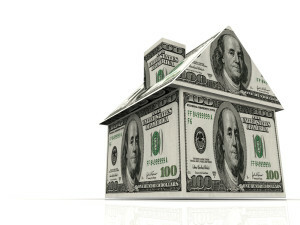 According to Market Watch, 43% of homebuyers in 2014 so far have purchased with all cash. While some analysts believe that the cash-buying frenzy will not last, there is always more room for negotiation when the buyer brings cash to the table. When it comes to buying a home in a hot real estate market, sometimes cash can net you a lower price than a mortgage. So, if you’ve just sold your home and are looking to buy a new one with cash or are otherwise planning your estate, here are some things to remember. As an empty nester or retiree looking to downsize, you often have cash from the sale of your larger home to purchase a new home. This allows you to choose a smaller home, pay cash, and possibly have money left over. Or, you can buy into a better community for retiring. So while you may end up with a smaller home, the amenities more than make up the difference. Sometimes, you want to gift a home to your children as a wedding gift, or as part of your estate planning. After all, homeownership is part of the American dream. However, gifting only a down payment may pressure your loved ones to purchase a home when they are not ready to be homeowners. A better option for them would be to purchase a home for them with all cash. The home is paid-for and their obligation would extend only to yearly taxes and insurance, but not the heavy burden of a mortgage. A paid-for starter house protects them from the ups and downs of the market as well, and gives them a basis for a mortgage when the time is right for them. Investment property that is completely paid for can be a “cash cow” for your retirement. The ongoing income from a rental that does not have a mortgage can make your retirement a little more comfortable, and is less problematic in probate than properties with mortgages would be. If you have a financial instrument that might give you a higher rate of return than the mortgage will cost you, it might make more sense for you to invest your cash in the higher return and to take out a low cost mortgage on the property. If you need to improve your credit report, it might be better for you to take a mortgage. This type of “good debt” can improve your credit score and make it easier to borrow money for other reasons. Additionally, there are tax benefits from holding a mortgage that, depending on your financial situation, may be more beneficial than owning the home free and clear. Of course, before you make this decision you should check with your tax accountant or financial advisor. When you find the perfect house and you’re ready to make an offer, don’t start with the “all cash” offer. If the sellers know that you are able to pay cash for their asking price, they will be less willing to negotiate with you. Let your professional real estate agent help you determine the best time to reveal your cards. We know the right time to offer cash to get the seller to agree to your offer. 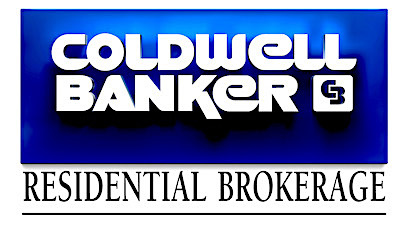 Call us today and we can get started finding the perfect home for you and negotiating the best offer for your needs. While home prices are on the rise in most of the U.S.—fueled by the low supply, low mortgage rates and investor buying—the number of Americans that own homes, as a percentage of the population, is decreasing. The reasons vary, since many current renters are former homeowners that lost their homes during the financial crisis and others simply do not have enough income to qualify. But some potential homeowners, with savings for down payments and the desire to own may be priced out of the market by as little as $1000. A new report by the National Association of Home Builders points out that an increase of just one thousand dollars in the price of a new home can upset the delicate balance of income-to-debt ratios required to qualify for mortgages. According to their report, that $1000 increase in a home’s price knocked over 200,000 potential buyers out of the market in 2013, assuming a 10 percent down payment and a 30-year mortgage. The NAHB report suggests that local regulatory increases—fees, permits, zoning costs and higher taxes for new construction—price new homes out of reach for otherwise qualified potential homeowners. Since it is in the best interest for most localities to have more homeowners than renters, this inadvertent price increase imposed by local regulations may ultimately produce an undesirable effect. Since homes in established neighborhoods are less likely to have the higher regulatory fees and taxes that new construction has, a solution is to buy a resale home. Real estate professionals like us specialize in finding the right home for the right price for qualified buyers. Homes in older neighborhoods have other advantages as well. For instance, initial outlay for a new home does not often include the cost of landscaping. A resale home typically has at least some landscaping in place. When a new homeowner is on the very edge of what they can afford, extras like that raised flowerbed you have your heart set on, the stone pathway you envision or an in-ground sprinkler system and newly laid sod often have to wait. With income not keeping pace with the cost of new housing, you may find yourself priced out of the new-home market. We can help you find an affordable solution without sacrificing the amenities you want in your new-to-you home. Compared to new homes, pre-owned homes have the advantage of negotiation between buyer and seller on some or all of a home’s features or components. Remember that any upgrades the previous owner put into the home—ceiling fans, upgraded faucets, hardware and appliances—typically come with the home. New homes often have warranty issues. The first owner ends up dealing with all of those issues so that by the time the second (or later) owner moves in, the potential for problems is less. A home inspection before your purchase should reveal any potential problems that then can be included in final negotiations at the time of close. In Sedona, buyers have the edge right now. We are in between seasons. Our summer season is the slowest time of the year. By the time October roles around, those folks who spend Winter in Sedona or Arizona will be arriving to enjoy warmer temps in the sunbelt state. Right now, home Days On Market are increasing and sellers are more willing to negotiate. Take advantage of this season to increase the strength of your negotiation power. For information on the best home purchase for you, give us a call. Low housing supply is causing prices to rise for rentals for West Sedona Rental property. If you are looking for income property, I can help you determine the right property for you. The current housing market, while picking up in most areas, has one basic problem: low supply. With many buyers choosing to keep their old home when they purchase a new home, fewer homes are on the market, driving up demand. Buyers that do not need the equity in their current property in order to purchase the home into which they are moving, are choosing to become landlords instead. The financial crisis and ensuing recovery has increased the demand for rental housing especially in Sedona. In fact, the cycle of buyers not selling their current home before buying a new one reduces the supply for homes to buy, thereby raising the prices and pricing entry-level buyers out of the market. Unable to buy the home they can afford, they then seek to rent a home that better meets their needs instead, resulting in rental price increases due to higher demand. For those able to become landlords, it is somewhat of a perfect storm since the ability to demand a higher rent increases the income from your rental property, increasing your equity. Don’t forget the other advantages of being a landlord too. Since your former home is now a business for tax purposes, repairs, maintenance, utilities, taxes, insurance, some fees, and other costs may be tax deductible. Be sure to consult a qualified tax accountant to find out what your tax liabilities or deductions may be when making your former home a rental. Remember too that collected rents count as business income, so be sure to establish proper accounting records for your property. The option of turning a home that currently is worth less than then its mortgage into a rental property offers a way to build equity into the home and shift the balance back toward the break-even point, while potentially making a little income in addition. So, rather than chuck more money into the current home, making it into a rental solves the upside-down mortgage issue while freeing up cash for the down-payment and mortgage on a new home. Some property owners, especially if they lived in the property, find it difficult to make the shift from homeowner to landlord. They mourn painting over their faux finishes with generic rental neutrals, and seeing a nursery turned into an office. They worry about potential damage to their property, and the associated costly repairs, and they fret about the possibility of months without a renter and having to pay on two mortgages at once. The best solution toward making this shift is to hire a professional property manager. A professional helps you establish the appropriate rental amounts to cover both the initial mortgage and other costs and repairs that may become necessary. 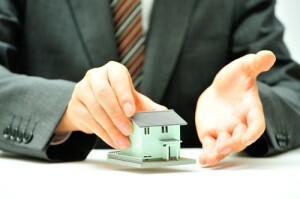 In addition, they offer a buffer between the owner and the renter that keeps the relationship entirely professional. Having a property management service handle your rental and renters can give you peace of mind while ensuring that your former home is in good hands. 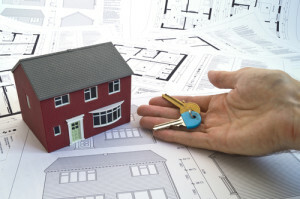 As your real estate professional, we can connect you with a property management professional, so let us know what your plans are so we can help. How to sell Sedona Real Estate for full price means establishing the right price at the outset. Often, homeowners try to “test the market” with a higher than fair-market price when first listing their home. This is a poor marketing strategy. When your agent tries to talk you out of it: Listen! My experience indicates that sellers value their home 10% higher than the market will bear. I have seen sellers value their home as high as 25-30% off the true market value. Remember, your home is just another house to a potential buyer. You miss the critical first 14 days when buyers and agents are most interested in a new listing. Other agents may dismiss you as an unreasonable seller that would be difficult to work with. Your home can no longer compete with other new listings fresh on the market, particularly if they are more fairly priced for your market. We are professionals that know the Sedona real estate market for your home. 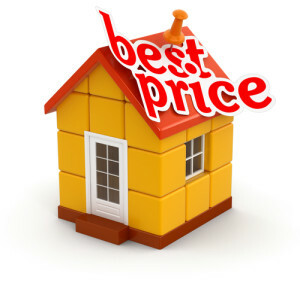 Let us help you price your home fairly from the start. When priced correctly, your marketing strategy works for you to sell your home as close to your asking price as possible. Make sure your home is in the best condition possible: make repairs, simple upgrades (e.g., light fixtures, faucets), and clean, clean, clean. Neutralize deep paint colors and strong faux finishes. This doesn’t mean to paint everything white, but a modern neutral such as café au lait, warm gray or deep cream sets a canvass for homebuyers to visualize their own furnishing in. Depersonalize your home: buyers want to see themselves in the home, not the former owners. Remove family photos, trophies, school banners, children’s artwork and other giveaways that might hinder a buyer’s vision for his new home. Make sure none of your personal information is visible: hide bills, letters, cards and other items with your name. Clear clutter and simplify furnishings: As we live in our space, we tend to add, but rarely take away. An extra bookshelf or side table fits our needs, so we ignore that it crowds our space a little. When buyers enter a furnished home, crowded spaces can make the house appear too small. Clutter, even decorative clutter, can obscure a home’s assets such as architectural detail, higher ceilings and beautiful wood trim. We can help you set the right price the first time, so call us and we’ll get started today. Having a second home in a favorite vacation spot (like Sedona) can be a great investment or an expensive luxury. 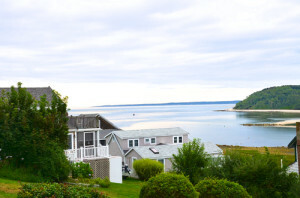 A beach cottage or mountain retreat is enticing while both interest rates and home prices are low. How do you decide if it’s right for you? Sedona has a small town atmosphere. In fact, approximately 10,000 “locals” live here. As you may already know, four to five million visitors enjoy what this town has to offer every year. Many decide to purchase for one of the very reasons below. My husband and I came to Sedona loved it so much we decided to purchase a second home within a couple of days of our fabulous visit. See a little snippet of my story below. If your second home is in the area where you plan to retire, buying it now, before you stop working and your income is higher might be beneficial. Beware, however, of tying up your cash or extending indebtedness beyond your retirement date. Also, avoid using funds from your 401K or other retirement accounts to purchase a second home. If several family members will use the property, consider buying the property together. This concept is not without pitfalls, so make sure all family members understand how and when the property is available for use. Be sure to designate how interest in the property transfers to heirs or create a Cottage Limited Liability Plan (LLC) that governs both the use and transfer of the property. This is similar to a corporation, where members own “interest” in the property rather than the property itself. You might be considering buying income property. Remember that the IRS considers income property a business that has tax ramifications. Be sure to check with your financial advisor or retirement planner before investing in property that you plan to lease or rent. 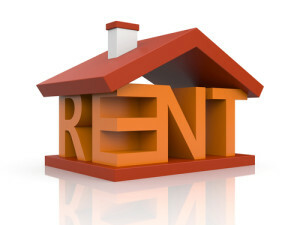 Rental property ownership requires ongoing expenses, including taxes, maintenance, mortgage payments (especially if the property sits empty), repairs between renters, insurance, and other costs. Income property ownership may provide ongoing income and be a great investment, but consider all the expenses before jumping in. In Sedona, there are city ordinances that address rental property. Some properties can only rent or lease on a long term basis. Besides the city ordinances, there may be Home Owner Associations (HOAs) that have certain CC&Rs (Covenants, Conditions & Restrictions) that come into play. Some homes are “grandfathered” and fit into a unique category that allows short term rental. Do your homework and decide what works best for you. I can help guide you in this area. I can help you find properties with positive cash flow, so be sure to let me know that you are looking for investment property. If you need a property management service for your new investment, I can direct you to the resources you need. Before investing in a second home and especially before financing a second home, review the potential for your situation to change. Is your job secure or could you be moved across the country? Does your family live near you, or near enough to the property for those family gatherings you envision? Do you have extra income to cover those empty months? Is the home in an area prone to natural disasters? Is it an area useful only during certain times of the year? If your second home is a condominium or a part of an association, can you cover the ongoing dues, assessments, or fees? Does the association require owner occupation? I can help you determine the best investment or retirement/vacation property for your situation, so call me and I will get you started in the right direction. As my husband and I got about 10 years away from retirement, we started looking around for that area we would like to spend a lot of time in. We did not make a determination if we were going to completely start over. We figured that would come with time. Our base would still be our main home in California. We were realists and knew that circumstances can change with every passing year. Many states and areas were on our “list”. Hawaii, Washington State, Oregon, the California coast or desert, Nevada, Texas, Georgia, Florida and parts of the midwest. Oh, Arizona was high up on the list. Every vacation included a question, could we retire or have a second home here. Once we visited Enchantment Resort in Sedona, the decision was made to start looking for property. At that point, we were about 6 years away from retiring. We secured a real estate agent on that same trip. At first, we were looking at raw land or lots to build our dream home. We visited during the winter and summer to make sure the climate was not a problem. As our search continued, it also changed. We started looking for a second home to make sure this was where we wanted to be. As prices started to rise, we became more focused in our search. We answered all the questions in the article above and after the two year hunt for that perfect place, we bought the current property we live in full time now. As a team, my husband and I crossed all the same roads and bridges you may have to encounter as we made that same decision you are contemplating. I know I can help you navigate around the potholes and forks in the road. When you are cleaning to sell your Sedona home, buyers notice. This can be the easiest way to add value to your home. A well cared for home goes a long way with a buyer and their perception of the home they are looking to buy. At Sedona Select Properties, I recommend starting here first. Investing some elbow grease while cleaning to sell can save you some money and make your home more attractive to buyers. Here are a few of the items to try. When cleaning painted walls, start with a clean microfiber cloth or sponge and water. Gently wipe or sponge walls. If the grease, grime, and dirt persist, use mild water-based cleaner or dish soap. For difficult stains like soot or tobacco smoke, use a spray kitchen cleaner or all purpose cleaner. Do not use the abrasive side of a sponge, steel wool, or other metal mesh cleaners as these will remove the paint and may mar the drywall. Ideally, clean stainless steel appliances once or twice a week. Disinfect with a disinfectant spray or bleach and water solution (1 part household bleach to 9 parts water), then use a wax-based aerosol spray. Lightly mist a soft, lint-free cloth and wipe over the surface to remove fingerprints and other marks. Don’t use anything abrasive—not even liquid cleansers or soft scrubbing pads as they can scratch or ruin the surface. If you have hardened, burned-on foods on your stove burners, remove them, and soak them in warm water and dish soap until it is soft enough to remove. Clean your bathroom and kitchen tiles using a neutral pH cleaner or make your own with a gallon of water and to 1/4 cup baking soda. Apply the mixture to floors with a soft mop or sponge. To clean your grout, use the same baking soda and water mixture, or use a toothbrush to apply a paste of an oxygen-based bleach and water. Allow the mixture to sit for 10-15 minutes, the wipe with a soft cloth or sponge and water. Once grout is clean, use a grout sealer to protect it. Apply the sealer with a small, slanted foam brush. Granite: wipe up stains immediately and have your granite sealed yearly. For rust stains, use a poultice of a half-gallon of water to 1/4 cup household ammonia. Use hydrogen peroxide in water for juice or coffee stains. Add a couple drops of ammonia for harder stains. Everyday scratches and wear respond to superfine, grade 0000 dry steel wool. Butcher block: To remove stains and scratches from solid butcher block, sand lightly with a fine wood sand paper. Oil the surface with food-safe wood oil. Solid Surface: Composite, solid-surface materials respond well to gently sanding with a fine dry steel wool or mildly abrasive cleanser. Remove stains with the oxygen-based bleach and water paste described above. Laminate countertops: Stains on a laminate countertop respond will to the bleach and water mixture or kitchen cleaners, but scratches are more difficult to disguise. Try a wax-based polish to fill in small lines and scratches or try this recipe. If your countertop is very marred, consider replacing it or using one of the DIY countertop faux finishes to give it an updated look. Clean wood floors with a water-based household cleaner or wood soap, or follow the instructions here. If your floor has scratches, use an oil-based polish in a color similar to your wood to fill in the scratches. If you have many scratches, consider lightly sanding the area and applying a stain-finish combination available at most hardware or paint stores. For synthetic carpets, you might rent a carpet-cleaning machine. Be sure to use only the soap or cleaning solution suggested, and avoid applying too much soap as the residue may attract more dirt. If you are unsure of any of these projects, call in the professionals at Sedona Select Properties. We can offer suggestions for you, so give us a call. Have me evaluate your home. As a real estate professional, I know what sells and what doesn’t and we can help you spend your money wisely to get the best return. Have a home inspection. A certified home inspector can point out areas that need correcting, fixing or removing. Paint walls a neutral but modern color. Gone are the days of all white walls, but sticking to taupe and gray tones gives a hint of freshness while remaining timeless. Request a home energy audit. Most utility companies offer this service. Sometimes simple lighting changes or additions to insulation give your home a higher energy rating and make it more attractive to buyers. Clean up landscaping and add regionally appropriate, low maintenance ground cover. If your home has “popcorn” texture on the ceiling, removing it and replacing it with a smooth or more modern texture will increase home value. Before you DIY this, however, make sure that your ceiling texture is not made with asbestos. Up until the late 70s, many textured ceiling preparations used asbestos flakes. If your home is newer than this, you’re probably fine doing this on your own, but if your home is older, higher a licensed professional with experience in asbestos removal and disposal. Replace your roof. If you live in a storm-prone area, your roof may have hail or wind damage that you cannot see. Have your roof inspected (most roofing contractors do this for free) and if your roof has storm damage, contact your homeowners insurance to see about getting it replaced. Often, storm damage replacement is time sensitive, so if you’ve had a heavy hail or windstorm, do not delay in having your roof evaluated or you may end up paying for it yourself. A new roof may not allow you to increase your sale price, but a damaged roof will lower your home’s value. Remove dated wallpaper. Simple removing outdated, stained, peeling, or faded wallpaper from kitchens, baths and bedrooms gives the home a fresher, less outmoded look. Instead of replacing it with new wallpaper, simply finish and paint the area with a neutral color in an appropriate finish. Replace light fixtures. 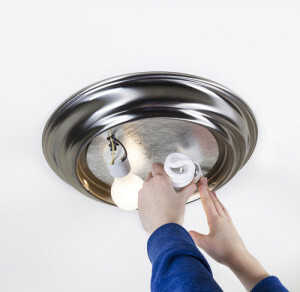 Ceiling and vanity lights that you replace with high-efficiency fixtures upgrades your home with very little expense and bring your home into the compact fluorescent era. Upgrading exterior lights with automatic lighting options adds a safety factor to your home’s exterior while reducing energy costs. Expose your hardwood. If you have hardwood flooring hiding underneath stained, faded or worn carpeting, remove the carpeting and expose the hardwood. If you can refinish the floor, do so, but even if you cannot, you can use some quick fix options to make your wood floors look inviting when your home is showing. When in doubt, refer to number one above: call me. I will help you determine the best options for your home. See my section on “Sellers” to get more information that will help you sell your home. 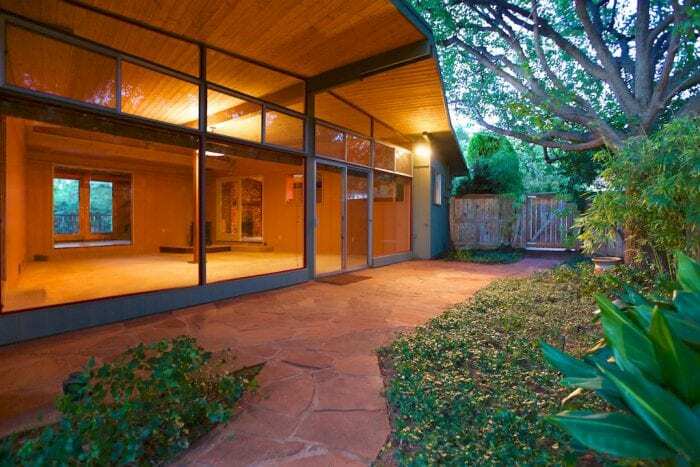 Scroll to the bottom to “Other Forms & Checklists to Assist the Seller”. 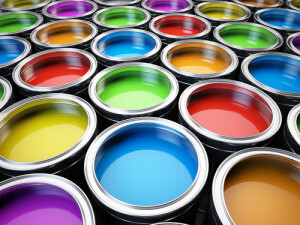 Whether you’re preparing your home to move in, or preparing it to sell, choosing the right paint from the myriad choices available to day can be daunting. Paints come in up to six different finishes, so even if you’ve chosen the colors, you still have to decide on the finish for your application. On a gradient from matte or flat to high gloss, there are both textural and visual differences in paint finishes. In texture, the gradient moves from a “dryer” feel to a “slicker” feel, but visually, it moves from less light reflective to more light reflective. Matte Finish: Called either Flat Finish or Wall Paint, this basic paint type has a chalkier feel and is not light reflective. It also hides imperfections, cracks and bumps because light does not bounce off them. This finish works well on interior walls such as living rooms and bedrooms, but can be more difficult to clean and may mark easily. Because it absorbs rather than reflects light, a darker matte-finish paint color is perfect for a media room. Eggshell Finish: Slightly more durable and light reflective than matte or flat, eggshell has just a minimal amount of gloss added to it, and a deeper color saturation. It holds up to cleaning better and often works well for living rooms and dining rooms where more light-reflection is desirable but a glossier finish is not necessary. Satin Finish: Often used for window and door trim, or ceilings needing a more reflective finish such as a the bath area or a workroom, satin finish holds up to cleaning and resists stains, marks and smudges better than matte, flat enamel or eggshell. Semi-gloss Finish: Used for trim, doors, cabinets and railings, semi-gloss resists most stains and marks while cleaning more easily. It reflects and refracts light, so it magnifies imperfections or textures in the surface. When using semi-gloss, care with surface preparation is vital to the finished product. Semi-gloss can work well in bath areas too, where a more reflective surface is helpful to make the room lighter and brighter. Glossy Finish: When applied properly, glossy or high gloss paints have a reflective surface similar to enamel, and creates a smooth finish for furniture and cabinetry. Because of its light-reflective quality, a glossy finish reveals and amplifies imperfections, but is the easiest surface to clean. When using high-gloss paints, carefully follow preparation instructions to get the best results. In Sedona homes for sale, I have found that choosing the right paint can help sell your home faster and for a higher price. Staying with neutral colors will be most appealing to a variety of potential customers. Buyers on the other hand, are hoping to add that little something extra to make the home theirs. Paint is the easiest way to accomplish this feat. Lush greens and rolling verdant fairways stoke homeowner dreams of the perfect lawn. This holds true in Sedona as in most areas. 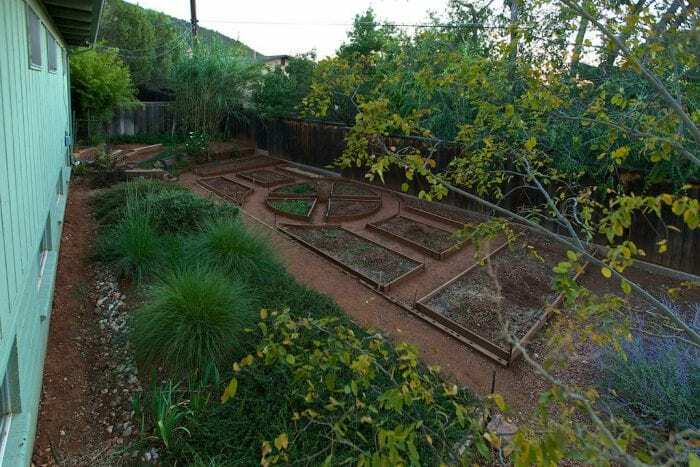 Though, many homes have desert landscaping in the front and backyard, so a green lawn can be very novel in Sedona and other desert areas such as Phoenix and Tucson. For most areas, July starts the season with the highest demand on the water supply. So maintaining those lavish landscapes takes knowledge and a plan. In Sedona, our two driest months are May and June. Monsoon helps to eleviate the burden of water consumption in our desert areas. Not all grasses are equal. When designing your lawn, be sure to use a grass that tolerates your climate. If you spent your childhood in one part of the country and have visions of a deep dark thick-bladed St. Augustine as your ideal lawn, but now live in a more drought prone area, where a Bermuda may be the optimal choice. The wrong grass species can increase watering and feeding requirements and reduce your enjoyment of your lawn. Consult a local turf expert before you order seed or sod and end up with a lawn-care nightmare. Drought or wet conditions in your location determine how often your lawn needs watering. With drought conditions being widespread, however, you may only have one or two days per week that you’re allowed to water, so it is important to maximize your results. When to water: If walking across your lawn leaves visible depressions in the grass and blades don’t pop back up immediately, your grass needs water. Water summer grasses once every three days (or as allowed by your city’s watering plan). Use sprinklers designed to deliver larger droplets nearer to ground. Mist and small drops evaporate more quickly than large drops. For more information on sprinkler systems, read the section below. Install sprinklers based on your property’s topographic needs. Consult and expert for your area even if you plan to install the system yourself. Most manufacturers can help you develop a plan and offer custom-designed systems for you. Once installed, check your sprinkler heads often. 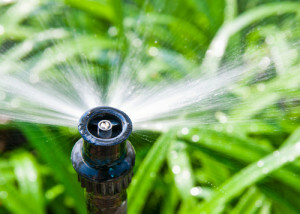 Adjust sprinklers to water only your lawn sidewalks or the side of the house. If water runs down the street, both your frequency and spray may need adjusting. Only apply water as fast as the soil absorbs it. If you have water runoff, divide watering times into shorter periods. Adjust your watering schedule each month to match seasonal conditions and landscape requirements. Have your system checked yearly for leaks and broken parts. Periodically aerating your lawn allows water to seep to the roots rather than run off the surface. A pattern of holes every six inches provides excellent root access for most lawns. Avoid cutting lawn too low. When you cut to a height lower than 1.5 to 2 inches, grass blades can no longer shade the soil, allowing water to evaporate more quickly. When you mow, leave the clippings on the lawn to further protect the soil and hold in moisture. We can help you find a property with the lawn of your dreams, so give us a call today. Summer Outdoor Living – What could be better! I love to garden. Sedona is a great place to experience the 4 seasons. I recently told my husband that I would not own another home without an outdoor courtyard. When we first looked at this home the courtyard was overgrown but I could see the possibilities. I was excited to see the rest of the home. Summer buyers want to know they can use the entire property for their own summer fun. If you need more suggestions on how to prepare your property for a summer sale, contact Sheri today. I have just added some additional features to the seller page to assist in the preparation of your home.